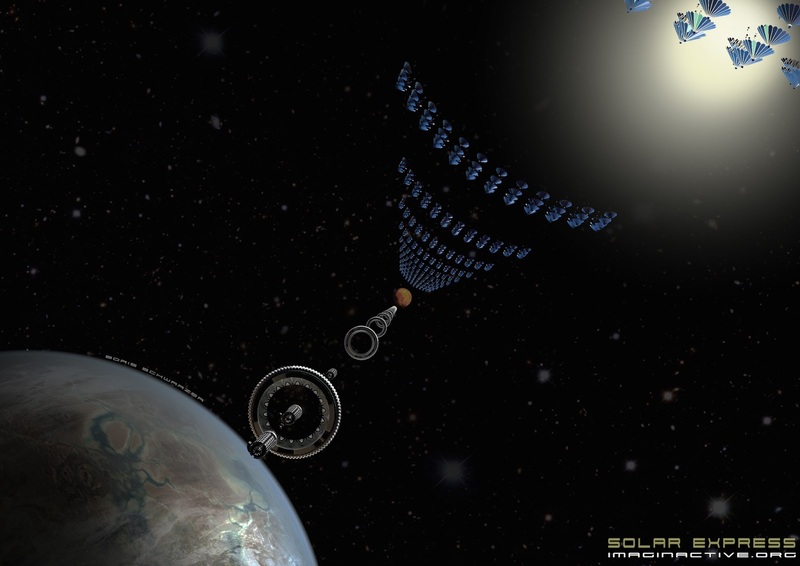 The Solar Express is an idea for a space train that would be designed and used to ferry humans, supplies and minerals between celestial bodies and space stations in our solar system. It would run non-stop, so smaller vessels would need to catch the train when it passed by. Charles Bombardier and his team see Solar Express traveling at roughly 1 percent the speed of light – about 3,000 kilometers per second (1,864 miles per second) – dropping the travel time between Earth and Mars to less than two days. The Solar Express would take the form of a series of aligned cylinders. Each cylinder would have a length of at least 50 meters, and one train would be composed of six of them placed in a straight line. These cylinders/torus would be split into four cargo bays and could be swapped in-flight with the help of maintenance robots. The Solar Express would first accelerate with rocket boosters. Stored fuel contained in the vessel’s core could be used to make course adjustments. The train wouId also use the force of gravity to slingshot around planets or moons. The speed of the Solar Express could be set at 1% of the speed of light, or about 3 000km/s. Huge solar arrays located along the train’s path could be used to capture solar energy and transfer it by laser to supercapacitors. Water harvested from comets or small moons would be used for humans living on the train and transported to other stations. The harvested water could also be used to create hydrogen and propellant, but the main propulsion system should take the form of an ion thrusters. A paper from 2000, The ultimate performance of gridded ion thrusters for interstellar missions An ultra-high specific impulse ion thruster of perhaps 150 000 sec and a thrust in the 1 N range might be achieved, for a 10 cm ion beam diameter. After some more consideration (after leaving the Singularity University conference -while driving back home), I believe that this Solar Express design is not workable. The picture is a big heavy ship. Getting up to 1% of lightspeed you would need something very large and wispy like a giant laser pushed sail or using lot of antimatter or nuclear bomb power or a nuclear fusion rocket. Those can top out at even 10% of lightspeed but getting up 1% of lightspeed would still take massive amounts of power and propulsion. Scaling up ion drive to tens of thousands or millions of newtons, I have not see any kind of proposals where that could work and where the ions could get up to that kind of speed. A big heavy ship design would need serious nuclear or serious amounts of antimatter. 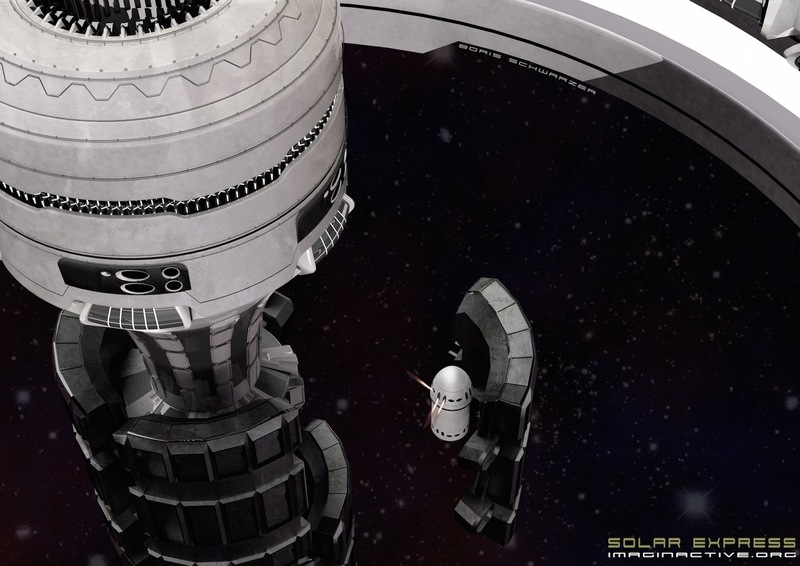 Mobile Cargo Bays (MCBs) and other spacecraft would allow for transhipment between celestial bodies (planets, moons, asteroids) and the trains. These vessels could use different types of propulsion to rendezvous with the Solar Express. They would need to match the speed of the train to attach and carry on their transhipment. The Solar Express would be used to transport material, minerals, vessels and even people living in sections under gravity. Of course, on the train they wouldn’t suffer from acceleration or decceleration. A large ‘space city’ would rotate around the longitudinal axis and provide artificial gravity inside so that humans could walk and live there during the long months of travelling.